Better collaboration drives better results. Top marketing and creative teams know that efficient collaboration is essential to producing dynamic, engaging, design-driven content. And with a workflow management solution like inMotion, you can make it happen for your team. 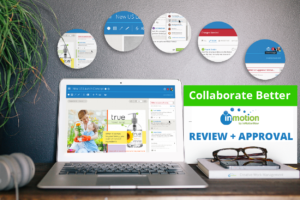 In this webinar, we’ll explore how inMotion’s Review + Approval tool fosters better collaboration, with intuitive new features like @mentioning for real-time communication, feedback management, and proof statuses to reduce confusion and delays, and a new mobile application that lets teams review content on the go. Watch now to learn how a streamlined workflow and better collaboration can enable your team to get projects done 85% faster. Improve your collaboration and get projects done 85% faster.